Ultrasonic Additive Manufacturing (UAM) is a unique metal 3D printing process currently pioneered by an unorthodox U.S. technology firm involving the merging of layers of metal foil using sound waves. The manufacturing technology firm controls nine patents covering all aspects of the UAM process. 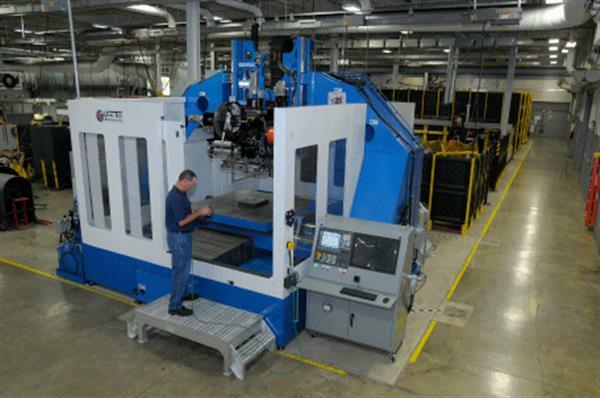 The process of Ultrasonic Additive Manufacturing actually predates the four-year-old Fabrisonic company, having been invented and patented by Dawn White in 1999. White’s patents have passes through a series of hands, with Fabrisonic now the sole operators of UAM technology. The solid-state 3D printing process is used to produce true metallurgical bonds with full density, and can be used on a variety of metals, such as aluminum, copper, stainless steel, titanium and more. The 3D printing process by which Fabrisonic produce their metal parts involves building up the solid object from a succession of metal tapes. Just like other 3D printing methods, a CAD model is used to construct a detailed 3D object, which can then be built via a series of mechanical operations. First, a base plate is fixed into place on the machine anvil. Foil tapes are then drawn under the welding horn, which applies pressure with a combination of its weight and special ultrasonic oscillations from a set of ultrasonic transducers. 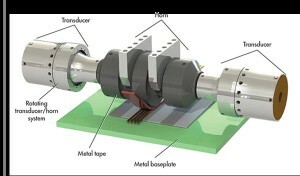 With this physical and ultrasonic force, the tape is bonded to the plate. This process is repeated until the full area has been covered in layers of foil, after which a CNC mill is used to remove excess foil and achieve the desired shape of the layer. This welding and milling routine is repeated, by first placing the separate tapes side by side, then stacking them in a vertical sequence until the 3D object is complete. Layers must be staggered in a staggered, lattice-like formation, so that seams do not overlap. This eliminates any potential weaknesses in the structure. Ultrasonic Additive Manufacturing occupies its own space in manufacturing processes, since it is really a combination of additive and subtractive methods. The laying and welding of the foil is an additive procedure, with the 3D shape built upwards and outwards from the plate. The crucial CNC milling, on the other hand, which gives the 3D object its precise geometry, is a subtractive method. Each year, Fabrisonic holds a symposium in which researchers using UAM technology converge to discuss their work. The 2015 event took place on July 29th at Fabrisonic HQ in Ohio.